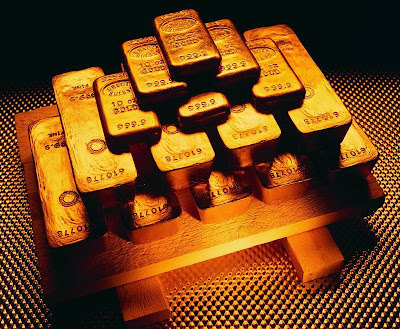 Gold-investment demand in China may gain more than 10 percent this year as buyers seek a haven from Europe's debt crisis and the prospect of weakening currencies, according to the country's largest bullion bank. "Investors here want to hold part of their assets in gold to hedge for the risks, especially now that the financial crisis has evolved into a sovereign crisis," Zheng Zhiguang, general manager of the precious-metals department at Industrial and Commercial Bank of China Ltd., said in an interview in Shanghai. "It's necessary for individual, institutional or even government investors to hold gold when the value of money is decreasing at a time of possible quantitative easing or excessive money-printing practices," said Zheng. Investment demand in China was a record 98.6 metric tons in the first quarter, 13 percent higher the same period in 2011, according to figures from the producer-funded council. Last year, it climbed 38 percent to 258.9 tons compared with 2010, as overall demand gained 20 percent to 769.8 tons. China's total gold demand may reach 1,000 tons this year, the WGC has said. Gold for immediate delivery traded at $1,599.02 an ounce at 12:41 p.m. in Shanghai, 2.3 percent higher this year. The price touched $1,526.97 on May 16, the lowest level since December, as Europe's debt crisis weakened the euro and investors favored increased dollar holdings. While a stronger dollar may pressure bullion, "I'm optimistic on the gold prices in the long term because of the China demand," said Zheng. "There are too many uncertainties now in the global economy, politics and the financial sector." ICBC represents more than 20 percent of the turnover on the Shanghai Gold Exchange, China's largest spot market for precious metals, and more than 30 percent of the gold-leasing business in China, according to Zheng. The lender accounted for about 16 percent of nationwide bullion sales last year. Gold imports by mainland China from Hong Kong climbed 65 percent to a record 103.6 tons in April, according to data from the Census and Statistics Department of the Hong Kong government released on June 5. The increase came even as Lao Feng Xiang Co. (900905), the mainland's biggest gold-jewelry maker, said in May that gold-demand growth in China may stagnate this year as falling prices put off investors and an economic slowdown crimps sales. The second-largest economy expanded 8.1 percent in the first quarter, the slowest pace in almost three years as Europe's crisis hurt exports. Should Greece exit the euro, the expansion may slow to 6.4 percent in 2012 without stimulus, China International Capital Corp. said on May 23. China, which on June 7 announced the first cut in borrowing costs since 2008, has curbed property investments to avoid a bubble. The Shanghai Composite Index (SHCOMP) declined 15 percent in the past year, while spot bullion gained 5.5 percent. On a three-month basis, gold demand in China eclipsed India's over the past two quarters, according to the World Gold Council. The increased wealth of China's middle class is helping to drive consumption, Albert Cheng, the council's Far East managing director, said in an interview in May. Spanish Economy Minister Luis de Guindos said on June 9 that he would request as much as 100 billion euros ($126 billion) in emergency loans from the euro area to shore up the country's banking system. That, coupled with weekend trade data from China, helped to boost stocks and commodities today. As China allowed investors to buy and hold gold only in recent years, "there's explosive, pent-up demand because the Chinese have an attachment to gold," said Zheng, predicting that growth in investment demand will beat the expansion in jewelry sales. "There's great potential for expanding China's physical-gold investment market."